This document has been drawn as a grazing lease, for letting fields (that may have buildings on them such as stables,barns animal shelters or other outbuildings) to private individuals or businesses to keep horses or other animals. The document contains specific provisions to ensure that the land is well maintained by the tenant. It is also flexible enough to be used to let rural land for other purposes, such as recreational riding, a camp site business, or a sports field. This is a lease of agricultural land (one or more fields, perhaps with buildings or shelters) to be used for personal use or non-agricultural business. This document is suitable as a grazing lease for horses or other animals. The landlord may allow the tenant to use the land in other ways too, not necessarily for grazing. The tenant is likely to be a private individual who needs additional paddocks, use of facilities on the land, or just room to ride. However, the tenant could equally be a business (such as a neighbouring livery requiring extra space) and the use could be unrelated to equestrianism (for example, the land could be leased as a camp site, sports field, clay pigeon shooting centre or safari park). This document creates a lease under the property laws of the Republic of South Africa. In balancing the codes with the law and the interest of the Landlord, we have followed the codes where reasonable, but have preferred the interest of the Landlord where there may be a difference. Should you choose this grazing lease, a licence, or a farm business tenancy agreement? Land law is complicated, having been designed to protect tenants dependent on living from the land from land owners who otherwise would have power to dictate terms of occupation. Using the wrong type of document has implications for a landlord on what a tenant may do on the land and the ease with which a contract can be ended. In disputes, the law is more likely to be applied to the circumstances of occupation rather than the title of the legal document. 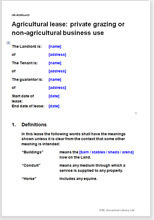 This lease should not be used if the tenant will live on the land (say in a caravan) or in a building on the land. If the arrangement is simply that the ‘tenant’ will use the land for grazing (and not for any other purpose such as recreational riding), a grazing agreement may be preferable to a lease. If the land is used for a specific purpose for a short period of time, such as to hold a show or a three day eventing competition, then a licence may be appropriate. The tenant is limited to using the land as set out in the document. This gives the landlord control of what the tenant does on the land, and thus how the land will be looked after. There are extensive positive obligations on the tenant regarding how the land should be maintained. We presume that if used for grazing, the land being let is of high quality. The obligations should help it remain so. This lease is comprehensive and provides alternatives for important choices.